The Devils are happy with the way the 2009 NEFHL entry draft went although they only picked up 5 players in the draft, but three were in the first 35 picks of the draft. The other 2 were selected in the 6th and 7th rounds, although the 7th round selection was a re-draft. The team also traded for two players during the draft. The Devils went off the board with the 5th overall selection, probably making a few other GM's shake their heads with the potential stupidity. After taking Filatov last year #2 behind Stamkos over the almost 100% clear favorite in Doughty the Devils this time took Dimitry Kulikov at #5 after Tavares, Hedman, Schenn and Duchene went off the board. Obviously this left a couple of superb forwards in MPS and Evander Kane, as well as another great defensemen in Jared Cowen and OEL still in the draft. After some internal debate on whether or not to pick up the potential goal machine in Kane or (a former Devil) Forsberg-esque MPS the Devils went with the talented Russian defenseman. Although most probably had him outside the top 10, or at best around the 10th spot itself the Devils knew he was the player they wanted. Mix that with the difficulty in trading down to one of the spots they just went for the defenseman they wanted. The Devils like Kulikov's NHL size as well as basically every other asset he brings to the ice, and with an overall lack of defensive upside in the organization they felt that taking Kulikov would be beneficial both now and long term. Right now they expect that he could pan out into a solid #2 defenseman who brings it on both sides of the rink. Next up at 15, the Devils once again had a decision on whether or not to take a forward, defenseman or trade down. After deciding their guys wouldn't be around during the early-mid 20's of the draft they decided to go for John Moore from the USHL. Making it 2 straight defenseman prospects taken in the first round. Moore is a longer term project like Gardiner last season but his offensive upside is huge and is skating ability makes him a blue chip prospect for the team. If he can top out as a 6'2, 210lb defenseman while keeping his skating ability he could be a very special player. While neither he or Kulikov would be defensive stalwarts (like a Cowen) they should be above average and coupled with their offensive abilities should be great assets to the team in a few years. However, combining their potential offensive numbers and their average to above average defensive games they should still be top flight NEFHL defensemen. The Devils would have loved to select Chris Kreider at this spot but felt Moore was the BPA and should really make the teams defense better in the future. Lastly, the Devils saw Simon Despres fall to them at #35 and while they were considering other guys Mike Lee (who went way later) and Stefan Elliot, they took a potential clone of current Devils prospect; Keaton Ellerby. Despres has some weaknesses to work on like playing a lot more physical because of size, and a weak shot from the point, but for his size and "untapped" offensive ability and as a 2nd round pick he could end up being a good NEFHL player. That makes three defenseman prospects picked up with their first three picks this year, and realistically all 3 have a shot at being top 4 defenseman in the NEFHL. While Kulikov is the closest at a year or two away, the Devils know that Despres and Moore will likely need a few seasons of higher level of competition before stepping into the NEFHL. The Devils have liked their forwards for awhile now, and still have some prospects coming up through the system like Filatov, Palushaj and Wilson so the Devils are relatively fine with selecting the three defenseman. It gives them a potential nice set of defenseman for the future with the three of Kulikov, Moore and Despres as well as guys already in the system like Stralman, Ellerby, Gardiner and long-shots like Donovan, Burlon and Robak. Plus, add in young pro players like Wisniewski and Edler and Grebeshkov and the Devils are excited at the teams future on defense, even if the majority of those guys are offensive defensemen. With the teams 155th overall pick, the Devils selected Wade Megan out of South Kent High School. He had a dominant year statistically and could be going to the NCAA in 2009 rather than 2010 as was first thought. The Devils GM is happy either way to select a prospect from his neck of the woods and will see how develops in two years time. With the teams last pick, 193rd overall, the re-drafted forward Ben Ryan of Notre Dame. The Devils had many meetings over whether or not to sign Ryan early this summer but decided to let him go in hopes of redrafting him. Originally a 3rd rounder in the 2007 draft the team is very happy he lasted until the 7th round in 2009. With the 2 year signing rule the team fully believes he will be signed next time around and could end up being a solid bottom six player with some scoring upside, as well as playing a little physical. And if you are wondering why the Devils had so many spots in between their selections, it's because the traded down 22 spots in the 3rd round to pick up David Wohlberg out of Michigan. The Devils really like his game and were surprised to see him consistently pick up points when they were watching current farm player Aaron Palushaj. After the first few games of the year, Wohberg quickly made his way onto the top line with Palushaj and Caporusso and showed that he had good defensive knowledge of the game, could be gritty at times and had a scoring touch nobody really saw coming. While it's unfortunate a guy the Devils really wanted, Mike Lee, was taken with their 3rd rounder they are happy to end up with Wohlberg. He's still a project but down the road could end up being a solid 3rd line player who can play on the first or 2nd PK unit. Instead of actually drafting a player with the 3rd they traded down for, this time the Devils just traded out of the draft completely and sent the pick to Tampa Bay for prospect Nick Bonino. The forward out of BU has had some good years in the NCAA program and the Devils are glad to pick up some center depth. Bonino needs to work on getting better footspeed but like his offensive awareness and think he has a shot (granted a long one) at ending up a Bolland-type player. 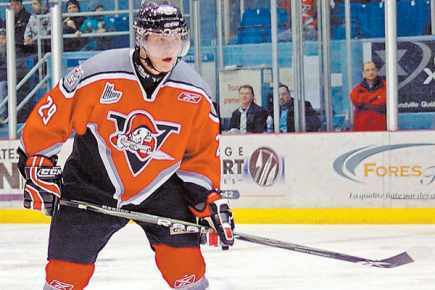 For a 3rd round pick and a spot on the farm the Devils had to take the chance on him.